After watching the first part of the OVA I always wanted to make a wallpaper from Hellsing. For this wallpaper I used a picture of the OVA dvd cover and some stock pictures from trees and crosses. This one is for Hellsing Ulitmate, right? Nice use of dull tones. Very shady. Yeah ! As always, alucard is the best vampire ! Niced and dark wallpaper ! The new oav are prety cool. 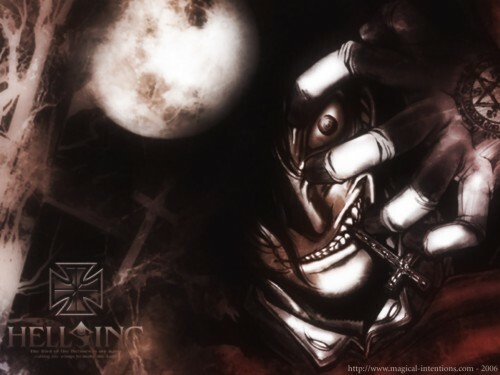 wow.. it's really cool to see alucard and they really blend well. wow this wallie rox! not enough comments on here.. great job!